Monsters in the Closet Video Slot Review - Casino Answers! Monsters in the Closet is a 5-reel, 50-line video slot developed by Microgaming, featuring a wild symbol, scatter wins, multipliers, a free spins feature and three bonus games. You can play the Monsters in the Closet video slot at Bovada. Coin sizes on the Monsters in the Closet slot machine are $0.01, $0.02, $0.05, $0.10 and $0.20. You can select up to 50 paylines at 1-10 coins per line on the Monsters in the Closet video slot. You can bet anywhere from the minimum total bet of a penny per spin up to the maximum total bet of $100 per spin. The Monsters in the Closet slot game has a good betting range that is suitable for casual players and most high rollers. You can use the skill stop feature to stop the reels manually by hitting the “Stop” button. 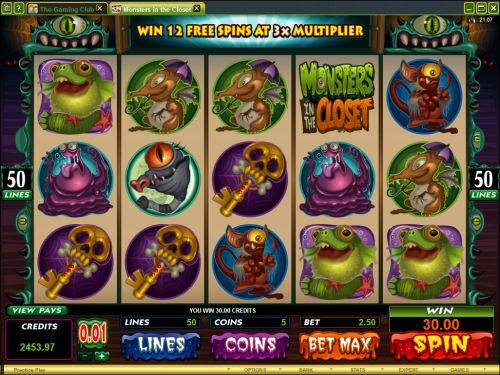 To play the Monsters in the Closet online slot game, select your bet and press the “Spin” button. To play all 50 lines at 10 coins per line, you can also press the “Bet Max” button. The Logo is Monster in the Closet’s top paying symbol. If you land 5 Logo symbols on a selected payline, you will win the 2000 coin top jackpot. The Logo symbol is wild and will substitute for all symbols except for the Skull Key and Bull Monster symbols. The second highest paying symbol is the Furry Monster, which can pay out up to 1000 coins. The scatter symbol is the Bull Monster symbol. You can get a scatter payout by hitting two or more Scattered Bull Monster symbols. You can win up to 200X your total bet by hitting five scatter symbols anywhere on the reels of the Monsters in the Closet slog game. If you land three or more Bull Monster scatter symbols, you will win 12 free spins with a 3X multiplier. All prizes during the free spins feature are tripled. The free spins feature can be re-triggered. The other scatter symbol is the Skull Key symbol. With the Scattered Skull Key, you can get a scatter win with three or more scatter symbols anywhere on the reels. You can win up to 50X your total bet by landing 5 Scattered Skull Key symbols. If you three or more Scattered Skull Keys appear on the reels in Monsters in the Closet, you will trigger the Monster Closet bonus game. In the Monster Closet bonus game, you will choose one of the closet doors. Inside the doors, you can find various monsters (which can pay out anywhere from 5X up to 75X your bet) as well as the Scary Slam Bonus and Destination Bonus. If you find the Scary Slam icon, you will gain entry to the Scary Slam bonus game. You will have until midnight to collect as many monsters in your selected door as possible. 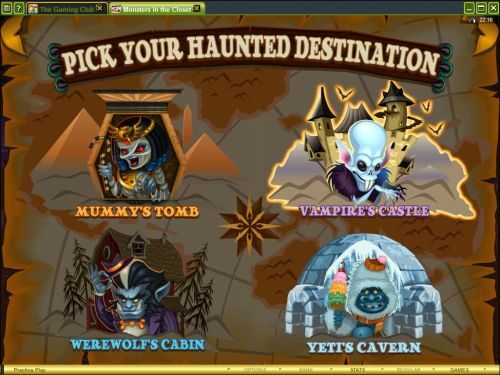 If you find the Atlas inside the closet doors, you will have a choice of four Haunted Destinations – Mummy’s Tomb, Vampire’s Castle, Werewolf’s Cabin or Yeti’s Cavern. Find one of the special monsters in one of the five doors in their home and win up to 200X your bet. Only the highest win is paid per selected payline. All wins are multiplied by the bet per line, except for scatters. All wins pay left to right, except for scatters (which pay any). Scatter wins are multiplied by the total bet. Scatter wins are added to payline wins. To use the autoplay mode on the Monsters in the Closet online slot machine, you must hit the “Expert” button. You can now play 5 or 10 autoplay spins. For advanced settings, hit the “AutoPlay” button and you can now play 5, 10, 25, 50, 100, 250 or 500 autoplay spins and stop autoplay if a win exceeds or equals $100, $500, $1000, $5000 or $9999. Autoplay will stop on any feature contained in the game. You can stop autoplay at any time. Monsters in the Closet has perhaps the best looking graphics and animations we have ever seen on an online casino video slot. Taking that out of the equation, there are also a great bunch of special features that will definitely enhance the gameplay even more. You can play the Monsters in the Closet video slot when you sign up and make a real money deposit at Bovada! Are USA players able to play the Monsters in the Closet online slot for real money? No, American players can’t play the Monsters in the Closet slot game for real money. Instead, you can read our Monster Money Video Slot Review. If you’re into spooky slots, you can read about more Halloween slots by seeing our list of Halloween slot machines.